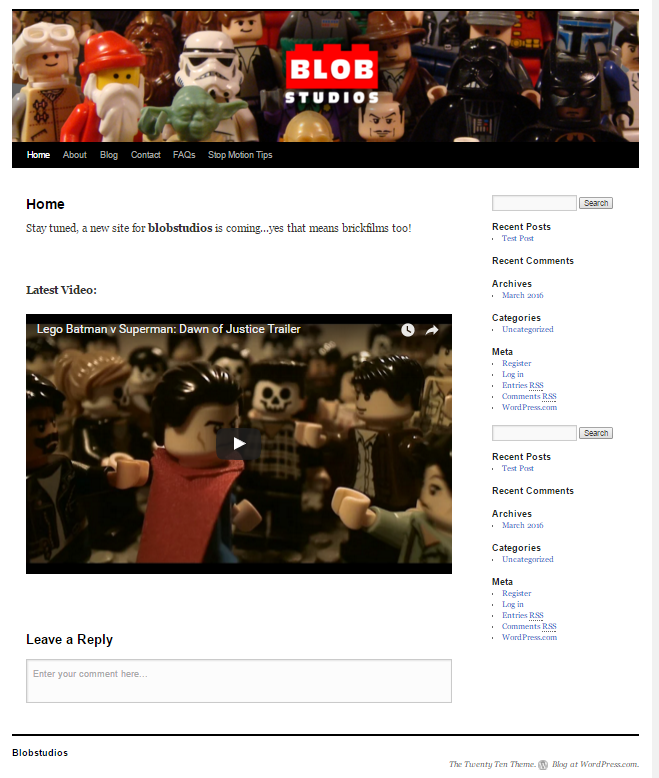 Following the completion of my Lego Batman v Superman trailer, my YouTube channel is in good hands for now. The next step in preparing myself for the big scary world was to rebuild my website in order to have a place to host my portfolio and direct interested people to. As the grad showcase requires business cards and posters, I want to prepare my brand in advance so that the links on these things go to a credible looking site. My current website is years old and is in dire need of a graphical update. I chose WordPress to build my site on as I have previous experience with it and I know it is capable of suiting my needs. 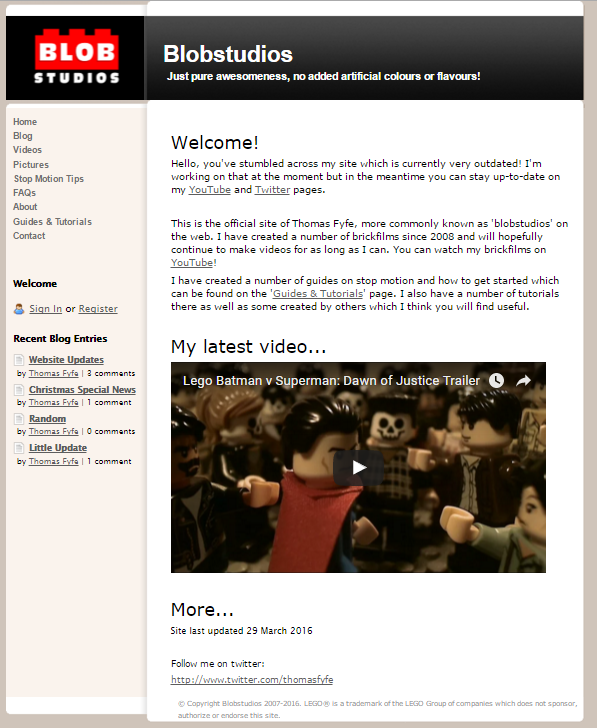 I previously drew out some design ideas for how I want the site to look. I am not a graphic designer however I think I have an idea of what looks good and what doesn’t so I rely on that. I want the site to be mostly associated with my YouTube channel since that’s the brand I’m known by and that’s what I will continue to work with. Although I decided on the “blob studios” name when I was in Primary school and although I’ve drifted in and out of liking it, I do recognise it’s the best I’ve got and its got history. My logo was redesigned in 1st year of university and while I think there’s room for improvement, I’ll be sticking with it for the mean time until I can commit time to redesigning it. The site should feature mostly my YouTube work however also have a portfolio page which expands upon my other work I’ve created in university. I am also considering moving in my honours blog to this site for greater consistency. I’d also be interested in continuing a regular blog after university as I’ve enjoyed the benefits of having a blog. I’ve made a start on the site including having the relevant pages however I need to choose a WordPress theme (I’m currently stuck with a default template) in order to get the look and feel I really want. To do that I need to purchase web hosting and in order to do that I will need to transfer my domain from my existing provider. I’m not going to rush into this as my priority is working on my final animation and dissertation. I can continue working on this after hand-ins where I will have more time. Continuing down the line of looking professional, I also wrote a CV (the first in a long time) and created a LinkedIn page. I will need to get some feedback on these but I can work on these at any point and simply starting them felt like good progress to me.